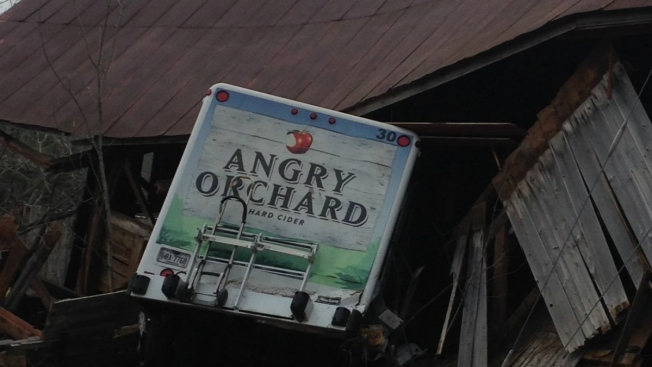 A woman stole an Angry Orchard truck and crashed it into a barn on Tuesday in Maine. Police say a woman stole an Angry Orchard hard cider truck from a Maine 7-Eleven store and then crashed it into a barn following a high-speed chase with sheriff's deputies on Tuesday afternoon. According to WCSH-TV, 19-year-old Nicole Dyment allegedly stole the truck from a 7-Eleven on Congress Street in Portland around 11 a.m. and then eventually crashed it into a barn in Limerick, which is about 30 to 40 miles away. Dyment has been arrested and faces numerous charges, including operating under the influence, driving to endanger, failure to stop for a police officer and driving without a license, according to York County Sheriff William King. She will likely face additional charges in Cumberland County. It was not immediately clear if she was being represented by an attorney. Dyment was injured in the crash and was transported to Southern Maine Medical Center in Biddeford with possible head injuries. She has since been released and booked at the York County Jail with bail set at $50,000. She is due in court Wednesday via video arraignment.